At each congress, results are improving and they are the combined effect of perseverance, experience, technology and didactic improvements. As in the Olympiads, each competitor has a historical background, based on the watchful presence of trainers who in many ways have favored and motivated him to take part in a great event which could seem to be only a dream. Here is a synthesis of the actual formulas of competition, whose rules you can consult in the special menu on the left of this page. These rules had been once again updated during the last meeting of the Council. If you want to take part to our next championships, we beg you to consult the rules. Further information can be asked by email to our jury: jury@intersteno.org. The competitor chooses the text to transcribe among three consecutive five-minute dictations given at speeds increased each minute. 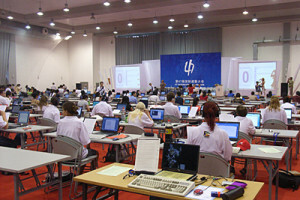 The initial and final speeds of each dictation are related to the language of the competitors, according to a comparison table set up by the Intersteno Council. At least the first three minutes of dictation must be transcribed successfully. Transcription will be handed out on USB-sticks (pen-drive) or with hand transcription by whom uses traditional shorthand. Every kind of technology can be used (shorthand – stenomachines – computer keyboarding – voice recognition). Competitors using speech recognition must compulsory use stenomask or silencer. The contest consists of 30-minute copying of printed text. Computer and stenotype keyboards can be used. Separate classification list is foreseen for competitors, using speech recognition, who must use stenomask or silencer. – pupils (up to 15 years of age) 240 characters per minute. Competitors must hand in their work on USB-sticks (pen-drive) provided by the Jury. Take of an ten-minute dictation using any kind of technology. The transcription is delivered without any correction, at the end of the ten minutes, on a USB-sticks (pen-drive) delivered by the Jury. Transcription is valid if at least the first three minutes taken are successfully transcribed. Competitors receive a text on a USB-stick (pen-drive). They have to make modifications (delete, replace, reorder, insert, emphasize, indent… – see the generic signs here) as shown on a printed sheet. The kinds of corrections will be indicated with international signs used by professionals in text correction. The competitors will enter as many as possible within a time frame of ten minutes. A 10-minute-long dictation at a moderate but increasing speed of a text that is divided into sections. This text has a title indicating its main theme, and several section headings indicating the subthemes. These ─ also dictated ─ title and headings are to be transcribed verbatim, while participants summarize in their own words and in complete sentences the content of each dictated section. The number of words of a section summary may not go beyond half the number of its dictated words. 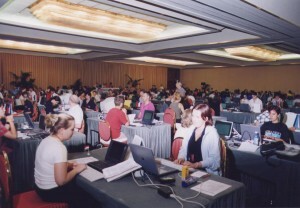 Participants work on the basis of their notes taken either by handwriting, graphic stenography, keyboarding (including the use of tablet computers), chord keyboarding or voice writing. It is not allowed to make an audio recording of the dictation. The transcription time is 60 minutes. The competitor receives, on a USB-stick (pen-drive), one or several texts in English as well as data and pictures. He will also receive instructions written in his own language. He has to work on these documents (structure and (re)formatting of text, inserting and smart positioning objects, selecting, sorting and merging structured data, automatic numbering, smart use of tables, advanced search replace, …) and so prepare a professional document within 75 minutes. For each category, the maximum errors allowed is 0.50 %.